From February the 7th to the 13th, you can pick up free Maple Leaf Top Dogs from No Frills Ontario! 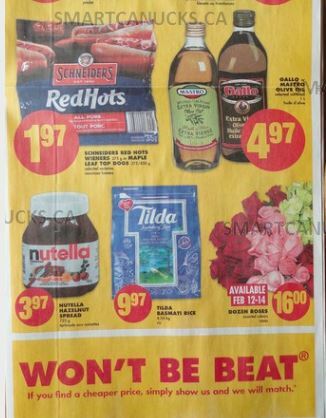 In the flyer that starts today, both Schneiders Red Hots and Maple Leaf Top Dogs are on sale for $1.97. If you were able to pick up the tear pad coupon valid for $2 off the purchase of select Maple Leaf products including the Top Dogs, you can use these coupons and pick up the Top Dogs for free. The tear pad coupon was among the last batch of SmartSource tear pads to come out, so if you look around and check stores in your area you may still be able to find some of these coupons. This coupon is only valid until March, so you will probably want to jump on this sale just in case we don’t see this price again before the coupons expire. Click here to view this offer in the No Frills Ontario flyer valid February 7th – 13th.